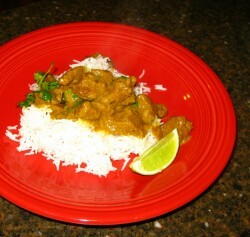 This curry was inspired by a recipe I found in Raghavan Iyer’s book, 660 Curries. His version is simpler than mine–the seasonings were only mango pickles and garlic paste, and he used a little less yogurt than I did, but it sounded so tasty, I just had to take the basic idea and run rampant with it. The first changes I made are obvious–I added curry leaves and switched out the mango pickle for lime pickle and relish. The pickle switch actually came first–while I like Indian mango pickle quite fine, I LOVE me some lime pickle. Mango pickle I can nibble. Lime pickle I can devour. So, out with the mango, in with the lime. And after the lime came into the picture I decided that curry leaves would go nicely with it–I like the slightly musky, earthy curry leaves with the lightly bitter, tangy flavor of lime. So, those were the first changes. I also added a few spices to the garlic, which like Iyer, I ground into a paste. Cumin seeds and coriander seeds joined Aleppo pepper flakes (standing in for Kashmiri chili flakes, which I am fresh out of) in the Sumeet grinder with the garlic. My thoughts behind these additions are that the main spice in lime pickle is fenugreek, which, while I adore it, has a slightly bitter edge to it. So, the earthy richness of the cumin seed and the citrus tang of the coriander seed would counterbalance the fenugreek while highlighting the lime, and the mild chili would add sweetness and just a touch of heat. Finally, I added turmeric for the color and its lightly astringent flavor, not to mention its health benefits. And I used a bit more yogurt than Iyer did because, well–I really like yogurt. I also cooked my curry in my ever-present pressure cooker, though really, it cooks up almost as quickly in a regular pot. Iyer gives about twenty five minutes as the length of time it takes for the lamb to cook through, while mine cooked in about twelve in the pressure cooker. Well, Britanny and I LOVED it and she said I should make it again. And again. And some more after that. I felt much the same way–I really, really liked it–which is not surprising since I adore lime pickle so much. Zak was not too sure about it. He said it had too much bitterness to it–and it is true that I like bitter flavors much more than he does. And he is right–since lime pickle is made from limes, skin and all–there is a bitter edge to it. And the main spice in the pickles is fenugreek–which is also somewhat bitter. Once I added the curry leaves, which Zak doesn’t like in the first place, I may have tipped the flavor balance too far towards bitter for his tastebuds. I will have to try making it again and see if I can tweak it around so he will like it. Maybe add an acidic component at the end like lime juice to help counteract the bitterness. But no, I am not going to add sugar–that just sounds completely unappealing to me. Heat ghee, butter or canola oil in a pressure cooker or heavy bottomed pot on medium heat. 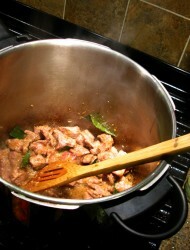 Add the curry leaves, and stir for thirty seconds. 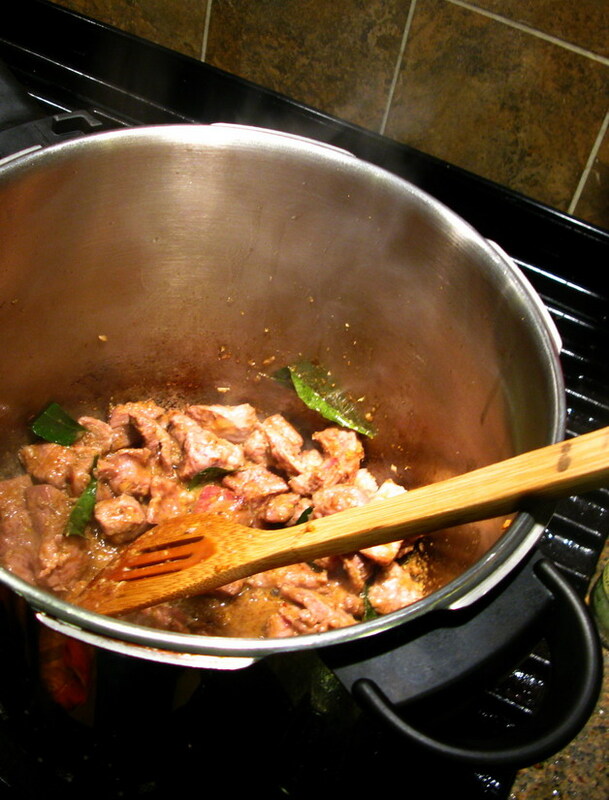 Add the lamb, and cook, stirring, until the meat juices start pouring out and the meat begins to brown. Add the garlic paste, and the spices and continue cooking until there is barely any pink left on the meat. Add the lime pickle bits and the yogurt and stir to combine. Stir in water. Turn heat back on under the pressure cooker, and with the lid off, simmer off most of the liquid in the sauce. There should be a little bit of very thick sauce clinging to the meat and barely covering the bottom of the pot. Stir in the the cilantro leaves, and serve over steamed basmati rice with a sprinkling of red onion on top, with lime wedges on the side for garnish. What about adding some sort of fruit to the paste (like a touch of the mango pickle) that will moderate the bitterness? I am not a fan of bitter flavors myself so when I make this, I’ll certainly use the original recipe. It sounds utterly delicious! Please sen d us another if you have time.